Happy Halloween Everyone! Today I've got debut author Kit Grindstaff here with tips on marketing. I'm definitely one of the nervous--okay terrified--ones who really appreciates Kit's advice. 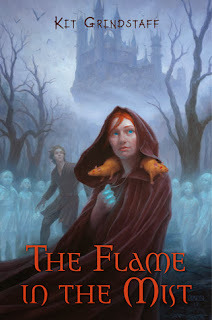 And she's offering a copy of her fantastic creepy fantasy book, THE FLAME IN THE MIST. PROMOTING A DEBUT KIDLIT NOVEL: Tips for Nervous (and not-nervous) Newbies, and a giveaway. Halloween is the time when spirits can supposedly cross freely from their world into ours. But to me, the prospect doing in-person events for my debut middle grade novel was far more scary. Public speaking? Lifetime terror # 1! Give me zombies swarming my house or werewolves howling beneath the full moon any day. They, after all, aren’t real—but presentations are. Two things helped me a lot with my fear. First was something called Speaking Circles. These are groups that exist all over the U.S., where you can practice speaking in front of a small group of people. With its supportive environment and expert guidance, my all-out quake reduced to inner tremble in just two sessions. Also, there’s safety in numbers. So as well as being part of an online group of debut 2013 authors called the Lucky 13s, I joined a local group of published kidlit authors who do events together. The company of more seasoned authors definitely eased my newbie nerves. Additional benefit: each member of the group is responsible for bringing in a few events a year, which increases visibility. If there’s just one piece of advice I’d give on the nerves front, it’s this: Let your book speak for itself! People want to hear about it. Communicate your passion for it and its themes and meaning to you when you talk—whether to groups or individuals—and listeners will be all ears. Think of it as telling its story, with you in the support role. That made it easier for me. As I began to do events, my confidence increased, and anxiety lessened. Some ‘firsts’ were capital-‘S’ Scare-reee, but remembering what’s important—getting the book out there, and connecting with readers— helped me keep it in perspective. Nerves began to take a back seat. Now, I look forward to events. So, fear factor notwithstanding, what events can authors do? What works, and what doesn’t? Here’s my list, and a bit about my experience with each. Celebrate the triumph of your book’s release! The support of friends and family is a great way to get over First Event anxiety. It’s motivating. Exciting. And hard to feel nervous with all that positive energy around. Check with your local store early; some book a couple of months out. Make the event go with a bang—it’s your book’s birthday party! I had balloons, food (friends were happy to help), a raffle, swag. I spoke for maybe 10 minutes, with just a flutter of anxiety. If not for Speaking Circles, I know I’d have been a wreck. But all went fabulously…and I was on my way. Avoid very large in-store events! Research shows that given too much choice, people don’t choose. My experience agrees. At two multi-author events with upwards of 20 authors, few of us sold many, if any, books. However, an event of nine authors, with just three of us in the store’s kidlit department, was terrific. We knew each other, so talked up each other’s books. That kind of mutual support is wonderful, and can make group events way more fun than solo ones. The four I’ve done have been my best events. The downside is that unless you’re already a known author, at some point you’ll experience people walking right past your table of books as though you’re invisible. And you can feel very lemon-like sitting there with a “Hi! I’m me and feel totally comfortable right now!” smile plastered on your face. Here’s a tip, though: people often don’t know that you’re the author of that lovely pile of books. Even with a poster of you/your book cover right there!! I realized that when someone asked me, “Where’s the Sci-fi section?” So write a sign saying something like, “Yes! I’m the author!” More people stop. They’re curious. Some have never met an author. For many, that’s a thrill. Also, doing presentations is definitely better than just sitting with your books. Stores publicise them more, and even a handful of expectant listeners makes all the difference. available. Once on their radar, you’ll be on their list of possible presenters. Usually it’s a panel format where authors either to talk about their books or about some aspect of writing. Like any event, they’re hit and miss. Best case scenario: In some states (e.g. NJ), educators can gain continuing education credits by attending. That motivates them to go, giving you a captive audience. Make sure you take whatever educator materials you have to hand out—school visit information, etc. You never know who’ll pick one up and book you for an event down the line. Usually held at the store, kids go to in droves with their parents to buy the books on their school’s reading list. Being invited to attend as a signing author is great (the store needs to get the Ok from the particular school, of course). Kids are excited to have an author there. And their enthusiasm is the icing on any event cake. In June, I attended the NJ SCBWI’s (Society of Children’s Book Authors and Illustrators) ace conference—my first from the author side of the fence! I co-presented two workshops with YA author and Jennifer Hubbard (she’s a fellow member of the local kidlit group), which made it way more fun and nerve-managable than doing it on my own. Once you’re published, check with your local SCBWI chapter what the possibilities are. Thanks to another local author friend, I was also invited to be on a panel at the PA Library Association conference this month, where I met loads of lovely librarians. A fabulous opportunity! Though some are huge book-biz or commercail affairs, there are many that authors can apply to themselves. I’ve attended three so far, all great, in very different venues (schools, street, etc.) Check here for upcoming ones, and apply early! They’re very rarely organized by publishers these days, especially for newbies. So a few of us MG authors from the Lucky 13s banded together and organized a mini tour of our own, coming up soon! Each of us approached stores in our area, and we’re hitting 6 venues on the east coast. (For full details, check The Lucky 13s blog on 11/11) Not something I could have pulled off on my own—so chalk up another for groups. If all that seems a lot, just remember: This didn’t happen all at once. 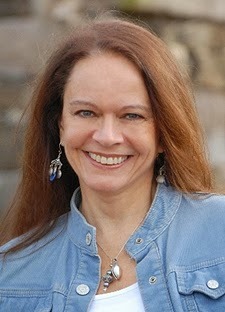 As you get out there and connect with other authors, you get to hear about events through them, and one thing leads to another. You help each other. Kidlit authors are notoriously friendly and helpful—just as are the wonderful bloggers on the online side, like Natalie here at Literary Rambles. You’re part of a community, online and offline. The trick (and treat) is to take it one step at a time. Push the envelope just a little. Then, none of it is so scary. Publicise events on social media. Twitter, Tumblr—whatever your favorite is. For local events, create a Facebook event and invite people. If you belong to local writer groups, make announcements on their forums. Leave time for Q&A at the end of presentations: It’s easy on you, and audiences love it. ~ An author friend spoke at a conference. She sold one book at the event. One! But her book was nominated for her state’s reading list because of her presentation. That is huge. Smell the roses: Promoting a book isn’t life or death! So remember to breathe, and live a little in the between (just a little). Remember the kids you’re writing for. They are the BEST! Their enthusiasm makes it all worthwhile. Enjoy them, and the process. And remember to live the rest of life too! Thank you, Natalie, for hosting me. And Happy Halloween, everyone! Thanks for all the great advice, Kit. It really is helping me feel less nervous and I'm terrified of this promotion stuff. To check out the trailer for The Flame in the Mist, click here. Set in an imagined past, this dark fantasy-adventure is for fans of Philip Pullman's The Golden Compass. Features Jemma, a fiery-headed heroine held captive in Agromond Castle, yet destined to save mist-shrouded Anglavia. Kit is generously offering a signed hardback copy of her book for US/Canada or an e-book for International winners. Fill out the Rafflecopter form below to enter. Next Monday I’ll be interviewing Meagan Spooner and Amie Kaufman and giving away an ARC of THESE BROKEN STARS. It’s a fantastic sci-fi story which really got me in touch with how similar sci-fi world building can be to fantasy, my favorite genre. The following Monday I have an interview with a 9th grader for my ASK THE EXPERT series and EARTHBOUND and UNTHINKABLE giveaways. Wednesday that week I have a big Indie giveaway. I'll have lots of great book choices by our followers. I'll also be announcing a new feature to help all of my followers on their writing journey and will be asking for some advice on promoting our Indie authors. Friday that week, I'll be doing a Gratitude Giveaway Hop. I'll have lots of great choices of YA books I've either read or am dying to read. I'm a horrible public speaker when it comes to talking about me and my books but I speak fine in work related circumstances. These are some great ideas. Thanks. Great advice! You mentioned several things that I never would have thought about. Whewee! That's a list for sure. So many great ideas...and we each have to play to our strengths, eh? I love the whole school assembly concept. It's been a long time since I did one of those, and the book fair? Gosh, I remember those as a kid. Was there anything better? Great post! I actually just blogged about self-promotion yesterday, but focusing on the earlier stuff, since I don't debut until June 2014 and haven't been through all this stuff yet - excited to be able to link here in the post. It's amazing how much you don't know until you get there! So true, Dahlia. I had no idea! But once you get started, you'll find that things unfold naturally. Just keep open, and ears to the ground - and good luck with your debut! The Golden Compass is one of my all-time faves so have to check it out. Kit's comment about too many authors at an event providing too many choices and paralyzing sales parallels what happens to me when I shop the big stores. Too many choices. Ouch, I feel Kit's public speaking pain, and yours. I'm not too good at it either, but kind of in the opposite way. In front of a crowd, I try to adopt a who-cares, actor's persona; on the bright side, I don't freeze up. On the dark side, I talk too fast, don't shut up, and usually wind up putting my foot in my mouth. Good stuff. There's a reason why people fear PS so much. Those are some really great tips! I've only done a few in-person appearance because like you, public speaking is not my thing. Alex, I sometimes find myself actually looking forward to it now!!! I would NEVER have believed it 6 months ago. Nothing like going in the deep end...Good luck! Thank you all for your comments/feedback! I'm glad you found some helpful info. Good luck in the giveaway, and don't forget it runs through 11/5 so you can grab more entries if you like. And I hope those of you who read the book enjoy it! Kit, this was super helpful. I'm forever away from having a book to promote, but reading the way you've broken it down makes the process much less terrifying. I'm bookmarking this post for future reference. Thanks! Thanks, Robin. When it's all a huge mountain ahead of you it can look pretty daunting. So yes, one step at a time. And remember, sometimes forever DOES come! I had never heard of reading circles. What a great tip! This whole post is terrific. I hope I have a chance to use all these great tips soon! Thanks. And thanks for the chance to win Flame in the Mist. Great tips! Too bad I can't use them just yet. One day! Wow so many great things going on Natalie! And such great advice from Kit! I'm taking notes on everything!! Thank you! Loved the reading circles idea! Great post today as always. LOL! Public speaking is your Liftetime Terror #1? I TOTALLY get that! If I hadn't had some teaching experience (which isn't the same thing, of course, but kinda helps) before I did my very first author presentation, I probably would have passed out from nerves! And what you said about people not always knowing that YOU'RE the author reminded me of something: On Saturday at my book launch, my husband said to me, "You should have made yourself a T-shirt that says 'I'm the author!'" Rosi and cleemckenziebooks - if it weren't for speaking circles I'd have been a wreck! It's a great friendly, safe environment to break the ice. Kit's book sounds fabulous. Being part of a group is helpful. Great advice for marketing. I like the idea of that Speaker's Circle - that's great! I used to be terrified of public speaking. I still sweat and struggle with the great "um" problem, but I've become way more comfortable with a lot of practice. Thank you all again for your comments - and for entering the draw. The winners have now been notified. Those of you who go ahead and read (or buy!) the book anyway, I hope you enjoy!